He’s clocked up ten consecutive top ten singles in his eight year career and now Shannon Noll is back with a brand new anthem ‘Switch Me On’ from his forthcoming fourth studio album. Noll hooked up with Good Charlotte’s Benji Madden and Sydney writer/producer Lindsay Rimes to write a driving single that stays faithful to his classic rock roots. 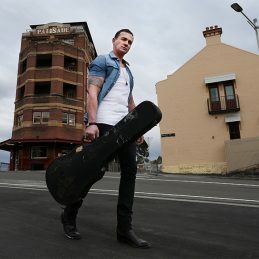 ‘Switch Me On’ will be released on Monday 25th July, however fans can hear the track from tomorrow, Tuesday 12th July via www.shannonnoll.com.au and www.facebook.com/shannonnoll with a game requiring participants to switch on the correct guitar riff. The new video, filmed in Tokyo last week will appear on screens on Monday 1st August. It’s been three years since Noll hit #3 on the ARIA album chart with Turn It Up, and despite having a meteoric rise to fame, the country boy from Condobolin, NSW remains unaffected by success and committed to his hard-working rock ethic. Cementing his place in the Aussie rock’n’roll hall of fame, Shannon’s in possession of a true blue larynx, built sturdy by grit, gravel and beer. If you’re after more evidence than the pumping chorus of ‘Switch Me On’, think back to the Red Hot Summer tour with Jimmy Barnes last year, in which the pair crossed the nation. As Barnesy noted, Shannon was often to be found rubbing shoulders with fans between shows, proving little has changed him since his bluesy cover band days. Noll however does have a new stable; ‘Switch Me On’ marks his first release with his new label, Mercury Records Australia. If ‘Switch Me On’ is the first taste of the album that’s to come from the multi platinum award winning artist, we await a modern classic.